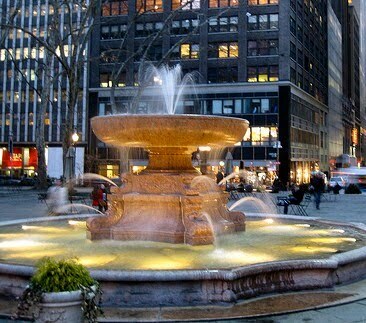 Did you know Bryant Park has its very own wishing well? Every two weeks the park's Josephine Shaw Lowell Memorial Fountain is drained for routine cleaning and maintenance of its filtration system. The process includes collecting all the coins from the bottom of the fountain, tossed in by park patrons and hopefully followed by wishes come true. Although the majority of the coins we find in the fountain are U.S. pennies, along with a fair number of nickels, dimes, and quarters, there is always an interesting handful of foreign coins thrown in by Bryant Park's visitors from all corners of the world. Our most recent bucket contained some coins we'd never pulled from the fountain before, hailing from exotic lands like Singapore, Israel, Russia, South Korea, and...Pennsylvania. Perhaps a Southeastern Pennsylvania Transportation token is luckier than a penny? What happens to all the coins once they've been fished from the fountain? After a rigorous process of cleaning, drying, and sorting, they take a trip to the bank. After it is deposited, the money goes right back into the maintenance of Bryant Park.